There’s only one thing worse than trying to depose the leader of a government – and that is to try and fail. The Barbados Labour Party had their leadership coup over a year ago when Owen Arthur decided he was finished sulking and wanted his toy back. Quicker than you could say “Pass the rum”, Mottley was out and Goin’ wid Owen was in control again. Regardless of what the reality is inside the BLP, on the outside a year later the party looks stable and ready to fight the next election. And that’s all that counts with the majority of voters. We’re all about image here in Barbados… nevermind that Arthur has a track record of 15 years of thiefing, abuse of power and negligence about the environment, public health and safety issues. The man is a leader, and the leader is in control. On the other hand, as we approach the next election the Democratic Labour Party leadership is in disarray and appears factionalized as a result of the recent “letter coup”. Prime Minister Stuart came away still in power but weakened – and worse, he’s taken no action to demote or otherwise deal with the coup leaders. Is he weak? Is he fearful that the party’s foundation is not strong enough to allow him to publicly affirm his leadership? How will such weakness and instability be viewed by the swing voters? Or is it just more of the same hands-off “leadership” style that we’ve grown accustomed to from our “invisible” Prime Minister? Bajans like leaders with strong public personas. Arthur has it. Mottley has it. Frundel Stuart does not. As a leader PM Stuart is about as appetizing to voters as porridge left out overnight and cooked up again the next morning. That doesn’t matter to the DLP spin machine though: the party has decided that Stuart will lead them into the next election which, according to some, will be called sooner rather than later. 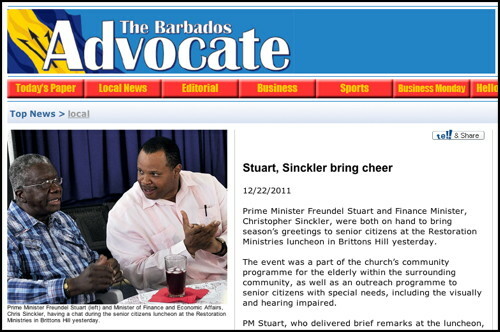 So the DLP media puppeteers arranged for photos of coup leader Chris Sinckler and PM Stuart to appear together in the papers. Just look at the photos: Nothing wrong here, folks – everything be just fine, so fine! And if you believe that, I have some excellent vacant building lots to sell you near the Arch Cot caves. With all this said for 2012 my gift to PM Freundel is a rocking chair. To Chris and Mia cups of humility. To Owen, a stand of courage and strength. My gift to Fumble Through-it is a coin. Flipping it allows even the most indecisive to make decisions. The dumbest thing PM Stuart can do is call an election soon into the new year.All indicators on the world economic front appear gloomy still at this point and these facts reflect here in Barbados.I would play for time with elections constitutionally due by march 2013,the dems best bet is to stay in the middle.I think everyone is taking every little thing and reading too much into it and building a mold heap.This island under the circumstances is managing fairly OK.France and Britain triple AAA standings are on the brink of being downgraded.Anyone believing that someone here in Barbados has a silver bullet for this economic crisis better read the Economist.Brazil just over take England as the world’s six largest economy.These are new times we are in and so it’s a good idea that our tourism board is courting Brazil. We going have to include in our tourism product that Casino equation if not we are going to drown.Both parties in Barbados hiding their heads in the sand with that gambling issue.America just began steps to embrace online gambling.Here we as a people going have to seriously look at privatizing CBC,portions of our Health and education systems.Making Government more efficient,pension reform which the BLP started by moving the retirement age to sixty seven and other means of earning revenue and reducing our national debt going have to be delved into. Both parties playing the same tune with CBC,both talking about a new Hospital when health delivery in Barbados is archaic to put it mildly and it has nothing to do with the infrastructure.Our tourism product is rubbish and trying to put it under central government failed with the Gems project.Casino hotel facilities need to be looked at as those guys can afford to build the modern hotel rooms we need. Does anyone here really think 20-40 years from now our leader can say that university Education will remain free? What is before us now is quite simple, are we going to send home thousands of people so to send school an elite crowd? Should we lower or wage bill or begin to charge for health care? Both parties are toeing the line on these issues and kicking the can down the road so they can blame the other when the inevitable change comes. If the BLP outlined a plan to deal with our increasing debt and making our high earners like tourism earn even more then a change of Government now will be welcome.The BLP on leaving office promised a new hospital,the DLP now talking about new hospital.What sense a new hospital and people still got to spend a day in the casualty? Both these parties aren’t showing any fundamental difference in planning or governance over the next 40 years.Same old same old from both of them.So I putting it to you let the dems stand where they are for the time being,the time for them to go will come soon enough. SAME OLD, SAME OLD, is this the total extent of Bajan ambition. Maybe a coalition Government would put a new slant on governance here, anything is worth a try in view of past performances. The time for the Dems to go is now but not just to bring back the Bees and start the SAME cycle all over again. The old line parties must be delighted that the only thing more enduring than their continuous cannibalistic behavior, is the paralysis of the electorate to do nothing and take it! maybe its time for BFP to start a revolution! it has to start from somewere. lets all pull together and make something happen. -and those who don’t learn from the past are condemned to repeat it. 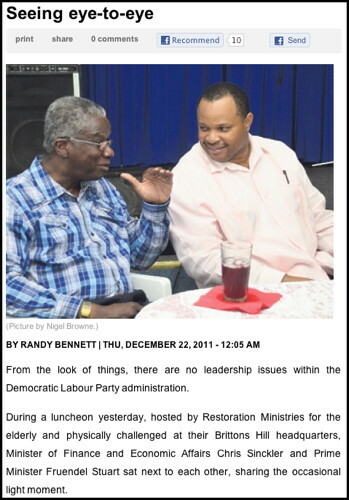 Barbados politics is now well on its downward spiral. delights in being stuck in two-party-politricks. Maybe Richie came 20 yrs. too early? Pity he hadn’t waited until now that voter dis-satisfaction is beginning to seriously ripen. Attempt at Socialism, now in decay. What you describe is Third World Socialism in decay. as a way out —–> “It has to get worse, before it can get better” ? if any of its artificially-sustained support mechanisms fail. …….oh dear this could get messy! Stand by, Barbados Defence Force. some excellent points and spot on. Barbados currency is valued at just a little bit better than junk bond status. On the open market it is worthless. Tourists are not coming like they used to and those that do come are cutting way back on what they spend. Landmarks like the Shipp Inn have closed. It is matter of time before there is a balance of payments problem and the IMF have to step in. Take away the US dollar debts from the US$ reserves and you will see how it really looks. Then look at unemployment where half the people in the work force work for the government who never lay anybody off and the rate is still pushing 12%. Or is it 24% of the people who are not working for the government? Time for a new direction. A third party with integrity would do nothing but good for the country. Freundel’s big problem with punishing the letter coups is that he may well throw out the baby with the bath water because the Ministers he has in his sights are the best of a bad bunch. Who is he going ti replace them with is they are dumped? Better the devil you know when they are the best of a deep pool of bad choices, ent? the good times are over for tourism and our politicos have left us with nothing to replace what once was. There is no money in the bank. The credit is exhausted. What’s to do? Does it matter who we elect next time around? BLP or DLP what will be the difference? Why will there be a difference? Is one party more moral or harder working? Does one party have better ideas and better ability to accomplish goals than the other party?